How do we read and interpret a fourteenth-century poet in the twenty-first century? In our course, we will contend with this very question as we step back over six hundred years into Geoffrey Chaucer’s late medieval world. 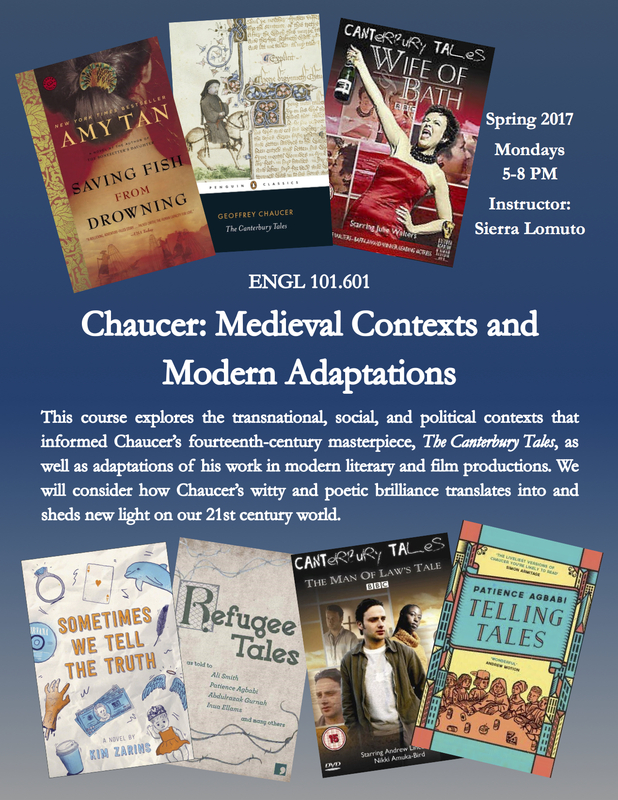 We will explore the transnational, poly-linguistic, social, and political contexts that informed his literary production and reception in the late Middle Ages; we will then turn to our own modern period and consider how the Chaucerian corpus has been employed, translated, and adapted in the twenty-first century. We will read selections from Chaucer’s Canterbury Tales, Troilus and Criseyde, and The House of Fame, taking time to learn and navigate the original Middle English (no previous experience with Middle English necessary or expected). As we travel back into the medieval past, we will query how our modern perspectives affect our lens of interpretation. In what ways are we limited in reading the past? And in what ways can the insights of a medieval poet help us think in new and expanded ways about our own modern world and its particular social, cultural, and political contexts? Our modern readings will include, but are not limited to, Amy Tan’s Saving Fish from Drowning (2005), Patience Agbabi’s Telling Tales (2015), the poetry and prose collection Refugee Tales (2016), Kim Zarins’s Sometimes We Tell the Truth (2016), and the 2003 BBC mini-series The Canterbury Tales; and through the digital humanities Global Chaucers Project, we will also explore the non-Anglophone translation history of Chaucer’s works. Assignments will include regular quizzes, a take-home midterm exam, a collaborative annotated bibliography, and a final project. For a virtual exhibit of final student projects, click here.